Circle Time is ubiquitous in preschools across the world. In the Waldorf schools, Circle Time is even continued into the grades. 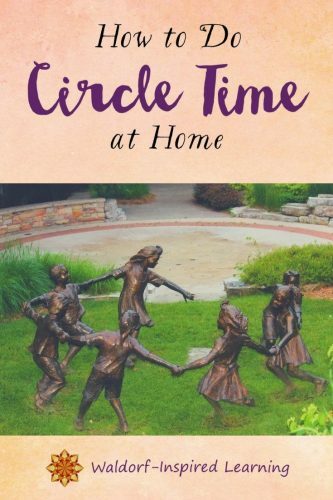 But one question I get a lot is this: Can you do Circle Time at home? Yes, you can! There are many ways of weaving this into your homeschool day. Here are some ideas for creating something that’s just right for you and your family. How to do Circle Time at home. First, a quick mention of how much I LOVE leading circles for larger groups. The intention of the circle is to build community while warming up for more focused work. And this works in the homeschool setting, at festivals, family gatherings or birthday parties, as well as at conferences! Because Circle Time serves the same purpose with adults as it does with children: to warm us up and help us focus on the learning to come. Here in this blog post, I want to give you a few highlights and some really actionable content for creating a Circle Time at home. Circle Time, also known as Warm-Up Time or Group Time, is when everyone gathers together to share songs, verses, bean bag games, movement games and activities. These activities are all rhythmic in nature and involve the whole body. Circle Time is usually done first thing, and can last anywhere from 5-20 minutes depending on your family and the ages of your children. Rudolf Steiner, the founder of the Waldorf schools, never actually talked about Circle Time. That term was an American invention and extends well beyond the Waldorf movement. What Steiner did talk about was the importance of what he called Ring Games for children that incorporate movement, music, speech, and games. He was also almost obsessive about speech recitation as a way to warm up for lessons or even with adults before lectures. His explanation was that these activities help to regulate our breathing. So all of these things have come together to create today’s Circle Time traditions. Transition from mundane family life – such as getting up, eating breakfast, doing chores – to lesson time. Weave in many of the Lively Arts, incorporating music, verse recitation, movement, and games. Create a sense of community among the participants. Steiner explained that both music and choral speech recitation bring people together and have a harmonizing effect. Here is one simple way to structure your story time. This outline will vary from family to family, as I said, so find a way to create your own that works for you. Light a candle (if you wish). Sing and recite songs and verses (perhaps alternate). The number of these will vary according to your family. Find what works! Choose some seasonal songs and verses and some that go with your current main lesson block. Include rhythmic verses with clapping or marching, bean bag games, math counting or times table activities. Recite a verse (keep the same all year) that it’s time for main lesson. Blow out the candle. Get a drink of water and start your lessons! There are lots of possible variations here. You can choose to do your Opening Verse at the beginning of the circle or at the end right before blowing out your candle. If you want to use the traditional verses, you can find the traditional morning verses recited in Waldorf schools here. You can also find or even write your own verse! If you want more ideas and help with bean bag games and verses, my post on Movement Games for Children has everything you need on how to make and use bean bags. Continue each day with each song or verse until your child(ren) knows it well. You’ll want to layer in new songs and verses so that you always have some that are familiar and some that are new on any given day. This section contains affiliate links for your convenience. You can read my full disclosure policy here. These are my all-time favorite resources for planning your own Circle Time. Circle Time can be challenging at home and it doesn’t always work for everyone. When the group is so small, some children feel too self-conscious and act out as a result. If this is the case in your home, I recommend that you simplify the experience to find where you can be successful with it. Is it just lighting a candle and singing one morning song? Reciting the morning verse with intention before you start your lessons? I have three children, two boys and a girl. When the boys were in kindergarten and the early grades, Circle Time was really challenging! They were competitive with each other and oh so squirrely. So our circles were short and included lots of marching, clapping, and bean bags. One of them participated much more than the other. We also did recorder lessons during Circle Time while standing. But our more focused verse recitation took place during main lessons. Then when my daughter came along, the boys rallied for Circle Time because I “needed their help.” They were a bit older and really enjoyed doing Circle Time for her. What about older children? When children reach about 9 or 10 years old, they are pretty much done with Circle Time. A few ways I’ve found to extend this are to start calling it Warm-Up Time and shifting the activities. You can still do the Opening Verse and work on poetry memorization of a longer poem. Then add in some yoga or exercise (even running around the outside of the house a few times works!) to get everyone ready for more focused work. Need more inspiration for how to do circle time at home? Here are a few of my Pinterest boards with lots of ideas for songs, verses, and movement games. And now I’d love to hear from you! How do you do Circle Time at home? Wondering How to Start a Waldorf-Inspired Homeschooling Enrichment Program?